From August 3-14, thousands of astronomers from around the world gathered in Honolulu, Hawaii, to discuss the latest astronomical discoveries at the International Astronomical Union (IAU) General Assembly. The Frontier Fields had a highly visible role during this two-week meeting, including a fascinating three-day focus meeting where all things Frontier Fields were discussed, including recent science results and the future of the Frontier Fields. In this post, I will highlight just a few of the Frontier Fields highlights at the IAU General Assembly. 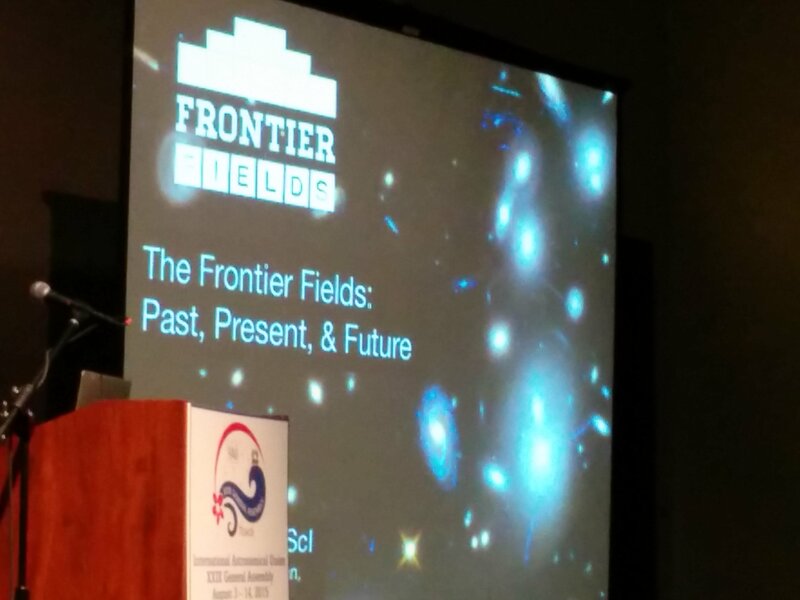 The Frontier Fields was highlighted with a three-day focus meeting at the International Astronomical Union General Assembly meeting in Honolulu, Hawaii. The focus meeting was kicked off with a great introductory talk by Dr. Jennifer Lotz (Principal Investigator of the Hubble Frontier Fields program). 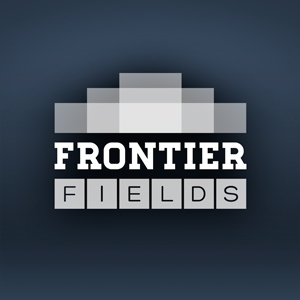 The Frontier Fields focus meeting covered much of the latest and greatest science results coming from the Frontier Fields program. Some of the new results included deeper understandings of galaxies in the distant universe, more complete pictures of the massive galaxy clusters, and the searches for exploding massive stars, called supernovae. Some big points of discussion at the focus meeting included the methods by which astronomers obtained and studied the Frontier Fields data. These methods included the analysis of the images and spectra as well as the development of physics-based models of gravitational lensing around the Frontier Fields galaxy clusters. The modeling efforts continue to be incredibly important because they tie our physics-based understanding of how gravitational lensing works with the observations of gravitational lensing, and they allow astronomers to accurately search for and study extremely distant and lensed galaxies. We will highlight some of the new results in future blog posts. As for the Hubble Frontier Fields, it was nice to see the progress on the observing campaign. 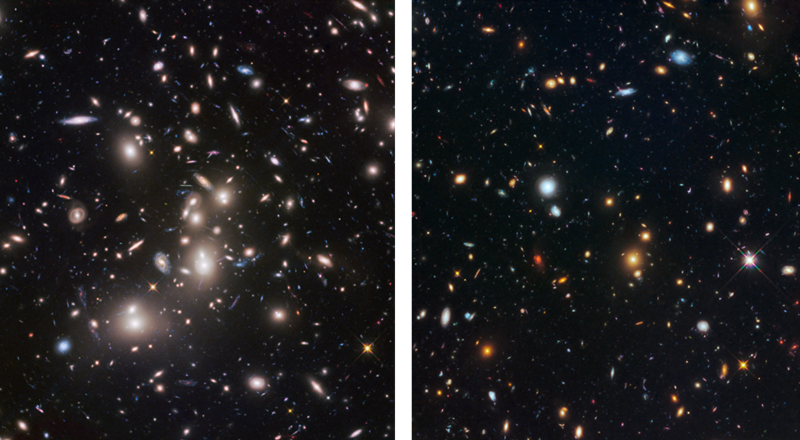 Hubble is two-thirds of the way through its Frontier Fields observing campaign, having completed observations of four out of the six massive galaxy clusters and their four associated parallel fields. The completed Hubble Frontier Fields images are shown below. 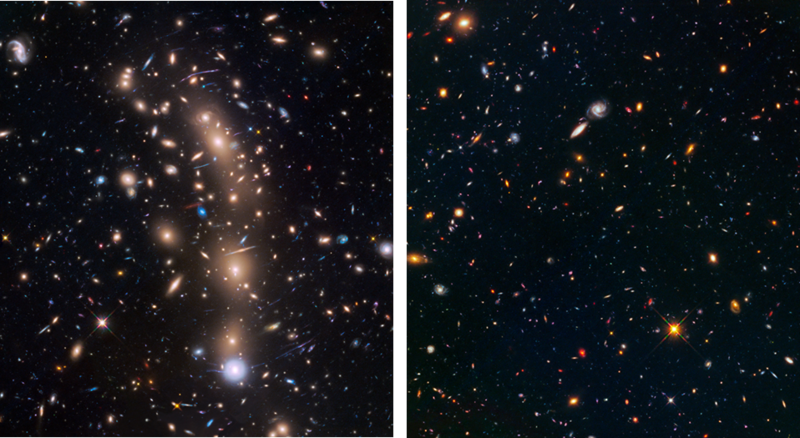 Shown on the left is the galaxy cluster Abell 2744. Shown on the right is the adjacent parallel field. This was the first completed pair of targets in the Hubble Frontier Fields program. Shown on the left is the galaxy cluster MACS J0416. Shown on the right is the adjacent parallel field. This was the second pair of completed targets in the Hubble Frontier Fields program. Shown on the left is the galaxy cluster MACS J0717. Shown on the right is the adjacent parallel field. This was the third pair of completed targets in the Hubble Frontier Fields program. This marked the halfway point of the Hubble Frontier Fields observing campaign. The MACS J0717 observations were completed in the spring of 2015, around the 25th anniversary of the Hubble Space Telescope. Shown on the left is the galaxy cluster MACS J1149. Shown on the right is the adjacent parallel field. This was the fourth pair of completed targets in the Hubble Frontier Fields program. Perhaps the most exciting aspect of the Frontier Fields focus meeting at the IAU was hearing from the multitude of ground- and space-based missions investigating the Frontier Fields. These observatories cover a wide range of the electromagnetic spectrum, from high-energy X-rays to low-energy radio waves. Scientific results were mentioned during this focus meeting from data obtained by the Hubble Space Telescope, the Chandra X-ray Observatory, the Jansky Very Large Array, the Very Large Telescope, the Atacama Large Millimeter/submillimeter Array, the Keck Observatory, the James Clerk Maxwell Telescope, the Herschel Space Observatory, and others. There was also a discussion of how the future James Webb Space Telescope will help us understand the cosmic frontier probed by the Frontier Fields. With so many telescopes staring at these 12 patches of the sky, a wealth of data is being accumulated and studied that will keep astronomers busy for years to come. We truly expect the science from the Frontier Fields to redefine our understanding of massive galaxy clusters and the distant universe. The Frontier Fields were highlighted in many other venues at the IAU meeting, not just during the Frontier Fields focus meeting. The Frontier Fields were a part of a Hubble 25th anniversary image gallery exhibit in the main concourse area of the convention center. A presentation was given to the astronomy education and outreach community about how the Frontier Fields are being incorporated into education and outreach products by the Office of Public Outreach at the Space Telescope Science Institute. Frontier Fields materials were available at the official NASA exhibit during the IAU meeting. Perhaps the most stunning display of the Frontier Fields occurred at NASA’s hyperwall. The hyperwall is a high-definition video wall that provides a large and clear view of astronomical images and visualizations. 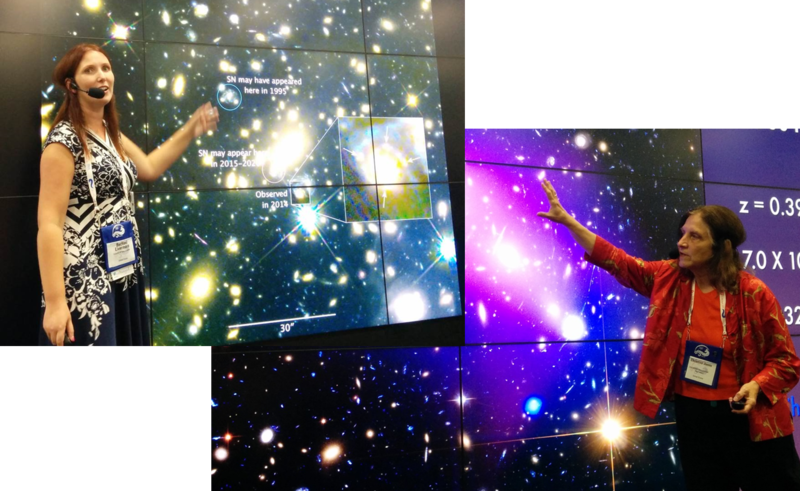 Dr. Rachael Livermore (University of Texas, Austin) gave a visually stunning tour through Hubble’s Frontier Fields, including visualizations that highlighted the effects of gravitational lensing. Dr. Christine Jones (Harvard-Smithsonian Center for Astrophysics) gave a truly spectacular multiwavelength, multi-mission view of the Frontier Fields that included data from the Hubble Space Telescope, the Chandra X-ray Observatory, and the Jansky Very Large Array. NASA’s hyperwall is always a big draw at professional astronomy meetings, public outreach events, and informal education venues. I highly encourage you to attend a hyperwall talk if you happen to be in the neighborhood of an event that has the NASA hyperwall. You can follow NASA’s hyperwall on Twitter – @NASAHyperwall . Images from the Frontier Fields were featured, in high definition, on NASA’s hyperwall. Top: Dr. Rachael Livermore presents the current status of Hubble’s Frontier Fields. Bottom: Dr. Christine Jones presents a multiwavelength view of the Frontier Fields. I love this. So encouraging for my granddaughter. She’s 13 & already taking advanced Geometry along with all honors classes. She’s interested in astronomy.